a project that began back in 2013 is finally ready for its close up! We are delighted to finally see Denver Housing Authorities Mariposa project - phase 6 is finally constructed and ready for move in. 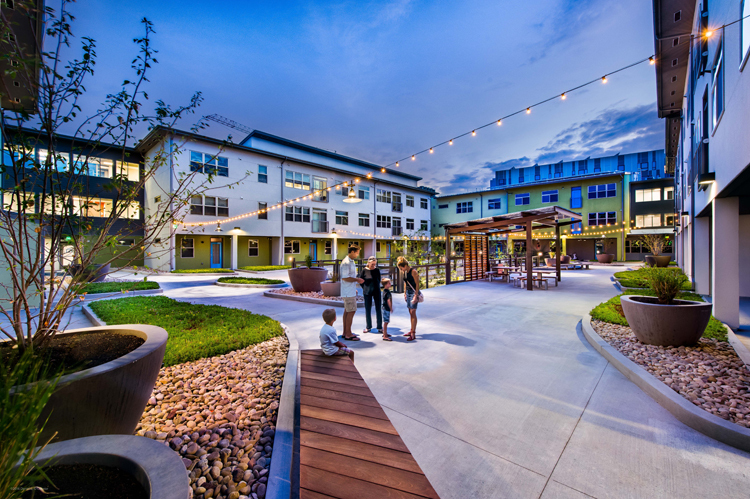 we were honored to partner with DHA to work on the design of landscape areas and features throughout both the streetscape and within the central courtyard spaces of this transit oriented redevelopment in the south Lincoln neighborhood. Our objective was to create a multi-story landscape feature that evolves and gets better over time, a concept that inspired the two level tree lawn, which grows out of parking level into the central courtyard. Custom benches and pots large enough for trees adorn the central courtyard and create a warm and welcoming environment for both residents and non-residents alike. String lights, warm wood benches, and pots large enough fro trees create an inviting and casual environment where people naturally and effortlessly congregate. Stop by on September 28th for the grand opening and check out this must see for yourself!